From theatrical performances to state-of-the art theatres, cruise lines are upping the ante by adding unique activities to enhance the onboard experience for their travelers. Not only will you be cruising to an unforgettable destination, you can also experience the best of life on the high seas. So pack your bags and book your next reservation onboard these cruise ships to experience extraordinary adventures while hitting the waves. Cunard’s Queen Mary 2 offers a state-of-the art planetarium where cruisers can drift amid the stars, visit the moon or float around in space from the comfort of their comfy seats. As the only cruise ship to bring the galaxy to the waterways, the QM2 brings curious travelers here to be exclusively navigated through the astronomical phenomenon of space luxuriously. Draped with domed ceilings and a presentation mirroring that of an IMAX theater, the Planetarium is much more than a documented film of the world, it is a once-in-a-lifetime celestial journey that only the Queen Mary 2 provides. Floating around in Barbie’s Dream House may sound a little absurd, but on Royal Caribbean young girls everywhere can feel like a real Barbie doll with the Barbie Premium Experience. Girls ages 4-11 are invited to take their love for the stylish doll to the seas by sailing to the Caribbean in their very own Barbie-themed stateroom, rock out at the Mermaid Dance Class, be a fashion model by walking the runway in Barbie-styled clothes, and create signature fashions for their dolls. Not only is this exclusive package every doll lover’s dream, it also allows children to make new friends and return to school with exciting stories that will even make their teachers green with envy. Add a little spice to your cruise adventure by partaking in Holland America’s culinary classes located in the Culinary Arts Center. Amateurs and experienced chefs are able to put their skills to the test under the instruction of the cruise line’s culinary masters. Cruisers will also be able to learn about the destinations they are sailing to through their staple dishes. So if you are sailing to the Caribbean, be prepared to appease your appetite with delicious jerk chicken. And if you just so happen to be dishing up pasta dressed with chorizo sauce, then this might very well be your official mouthwatering welcome to the Mediterranean. If Atlantic City and Las Vegas ignites an unbridle passion in your bones because of their endless gaming possibilities, then you will definitely enjoy playing Blackjack and Three Card Poker with other high rollers onboard Princess Cruises. This floating casino headlines its way into the heart of gamers looking to score big through its wide collection of modern slot machines, game tables, and gives specific ticketholders the opportunity to yell BINGO after they’ve won. Ice skating never seemed more adventurous than beyond the sea. And Royal Caribbean International has addd a cool new experience by adding an ice skating rink onboard. With your friends or loved one in tow, or even if you are by yourself, you will have the time of your life performing tricks and maintaining your balance with other determined skaters. Just try not to let your sea legs get in the way of your skating legs. Imagine twirling and moving your hips like a professional as the ABC television show comes aboard Holland America. Yup that’s right; you and your partner will get the chance to compete in the Dancing with the Stars: At Sea competition in front of a live audience where you will be judge and eliminated based on your performance just like on the show. The teams with the highest score from all of Holland America’s ships will be able to partake in the ultimate faceoff and bring a guest to the seven-day Champions Cruise in December 2014 for the highly desirable mirror ball trophy, where the winner will be given the sought-after title Holland America Line Dancing with the Stars: At Sea Grand Champion. 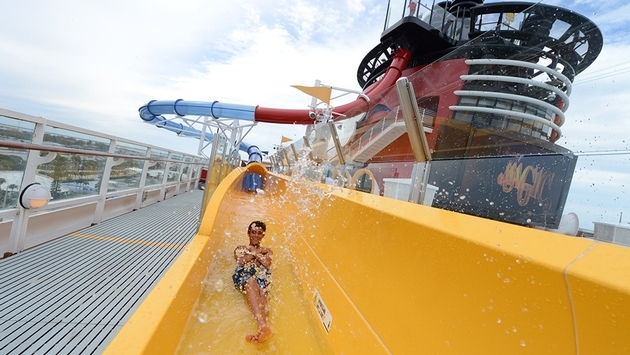 Disney Cruise Line is famed for bringing the legendary theme park amid the sea, but travelers can also expect a thrilling ride on the AquaDuck of Disney Dream, which is arguable one of the coolest water slides in its class. With 765 feet of sliding fun through an acrylic tube, you’ll be screaming in pure delight slipping through the complex slide, mirroring a rollercoaster ride before plunging into the lazy river. If you can keep your eyes open long enough, you will be able to enjoy the beautiful views of the ocean and have a direct view of cruisers swimming below in the cruise line’s pools. Cruise ships are also known to be relaxing, especially with the beauty of the vast ocean right at their guests’ feet. However, travelers can escape deeper into Celebrity ships’ picturesque surroundings from the AquaSpa filled with the amenities of the award-winning Canyon Ranch SpaClub. On Celebrity Cruises, travelers can unwind under the serenity of the spa’s manicure and pedicure treatments, acupuncture procedures, as well as dine in the Blu Restaurant — an exclusive restaurant that tailors to its AquaClass guests with the Persian Garden, gourmet cuisine, lounge chairs, and an aromatherapy-infused atmosphere. If you have thought you’ve seen the best views a cruise ship can offer, think again. Princess Cruises has designed the innovatory SeaWalk on its Royal Princess, placed 128 feet in the air stretching about 60 feet long. You will be able to experience the sea in a whole new fashion from a seagull's-eye view, as long as you are not afraid of heights. But even if you are, this unbelievable sight may just be too spectacular to miss. There’s nothing like kicking your shoes off and stretching out on freshly manicured grass. But did you know you could do this from the comfort of your cruise ship? Celebrity Cruises Equinox provides the perfect accommodations for travelers wanting to enjoy authentic rounds of golf or even a good book while fresh grass sinks beneath their feet. Located on the ship’s highest deck you’ll be floating in air while the dramatic sea flows below. How perfect is that?